With the Ryder Cup just under way in Gleneagles, I was inspired to look again at one of our collections with a golfing theme. 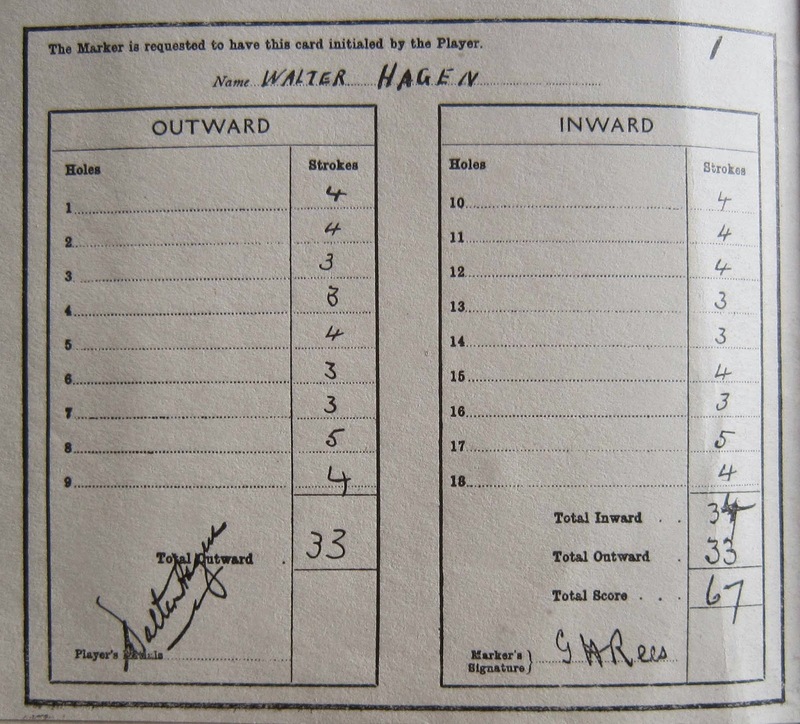 Although many doctors undoubtedly enjoyed playing golf, the connection between the game (developed, of course, on our own Leith Links) and one Edinburgh Hospital was much more involved than that. The Royal Edinburgh Hospital for Sick Children (REHSC) had been bequeathed the estate of Muirfield by Lady Jane Meikleham - they first opened a convalescent home there in 1906. This initially modest venture with accommodation for ten children proved inadequate and a new building was opened there three years later. With lucky chance, the building was adjacent to the Muirfield golf course, and from 1929 the Honourable Company of Edinburgh Golfers allowed the REHSC to profit from the sales of and advertising revenue from the Open Golf Championship held annually at Muirfield in late June. So whether you’re braving the Perthshire traffic or safely ensconced in front of the TV, LHSA wishes you a good golfing weekend! Within LHSA’s collection are a number of display boards and captions, created for exhibitions over the years, which bring together images and stories from the history of medicine in the Lothian region. As such, they have become archive items themselves, a record of how the history of medicine has been displayed and many have been rarely viewed since their original display period. One of these items is a board illustrating Cheyne-Stokes respiration (ref. D P264 FM), probably dating from the 1970s or 1980s. The display shows on the left a portrait of John Cheyne and on the right is a portrait of William Stokes with a sample trace of Cheyne-Stokes respiration between them. John Cheyne was born in Leith in 1777, the son of a general practitioner. Initially apprenticed by his father, he studied for an M.D. at the University of Edinburgh, graduating in 1805. Cheyne worked as an army surgeon, then at the Ordnance Hospital at Leith Fort. In 1809, he moved to practice in Dublin where he became the first Professor of Medicine at Royal College of Surgeons in Ireland in 1813. While there he published his description of a phenomenon of malfunctioning breathing in very sick patients. He noted that the patients’ breathing would stop entirely for a quarter of a minute then it would start again slowly, increase by degrees until it was heaving quickly then gradually cease again, with a total of approximately 30 breaths per minute. Some of the principle causes of this condition are brain haemorrhaging, advanced renal failure, heart failure and narcotic poisoning, therefore it is often thought of as a sign of imminent death. William Stokes (1804 -1878) is regarded as one of the greatest teachers of clinical medicine. Stokes studied in Glasgow and Edinburgh and like Cheyne he relocated to Dublin. Twenty-eight years after Cheyne’s work, Stokes recorded another example of the respiration phenomenon for publication in the ‘Dublin Hospital Reports’ and quoted Cheyne, although he apparently added no new details. Perhaps because of his renown in the medical world, Stokes’ name has become inextricably linked to John Cheyne in the definition of Cheyne-Stokes Respiration. What is also interesting on the display is that below the Cheyne-Stokes trace is another for comparison, where the patient has been injected with a drug, theophylline-ethylenediamine. In this case the respiration has gone back to normal, showing 20th century developments towards preventing the condition. According to the caption, this trace is from the first use of the drug in Great Britain for this treatment, in 1937 in Edinburgh. Here is the last account of my internship with LHSA - today I am going to talk about… money! Archives often have to be very imaginative in order to find funding for important programmes such as conservation, cataloguing or educational projects. So I have been collecting information on possible external funders and have created a directory for future use. With more than 8,500 funding organisations in the UK alone, a fundraiser should always stay clear-minded! What is the taxonomy of funders? 1. Firstly, the big funders. They generally fund a large spectrum of projects. We find public (or assimilated) bodies like the Heritage Lottery Fund or the Research Councils. Charities such as the Wolfson Foundation, the Gatsby Charitable Foundation and the Wellcome Trust (funder of LHSA's current projects) are extremely generous and award annual grants amounting to millions of pounds. 2. Family Trusts, professional bodies and London livery companies populate the second category. They generally give several dozens of thousands of pounds to charities operating in fields related to their main interests. 3. Finally, there are the small trusts distributing a few thousand pounds a year. Their scope of activity is often more restricted - one example is a bursary that is only available for descendants of French Protestant families from the Charente area (north of Bordeaux) who settled in Scotland in the 18th century, to study in Scottish universities! When not prospecting for external funding, I have visited other collections nearby. Firstly, a tour of the University's Anatomy Museum to admire skull casts of Burke and Hare. And then the archives of the Royal College of Surgeons of Edinburgh where I have been able to discover the surgical tools used by Norman Dott, a neurosurgeon, whose archives I’ve previously been cataloguing. The picture below shows my colleague Liz and I at the College of Surgeons - Liz wasn't too keen when I suggested we try out the instruments! 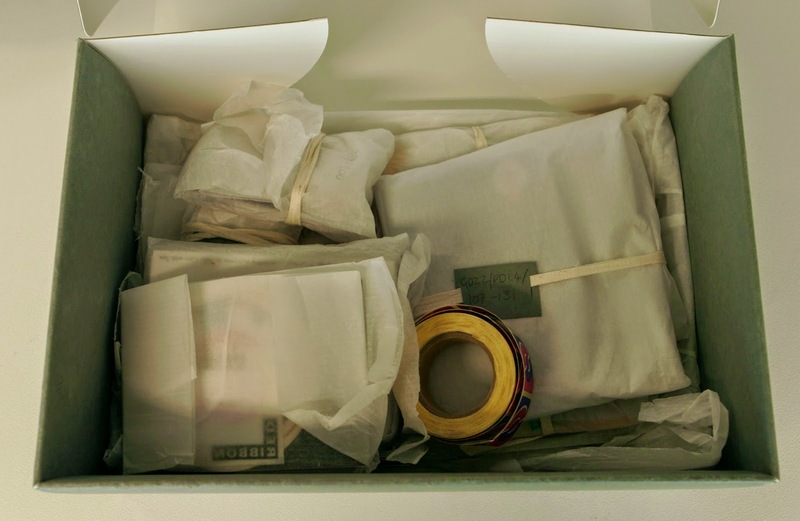 This week Project Conservator, Emily, talks about the benefits of working with an archivist in the HIV/AIDS project…. 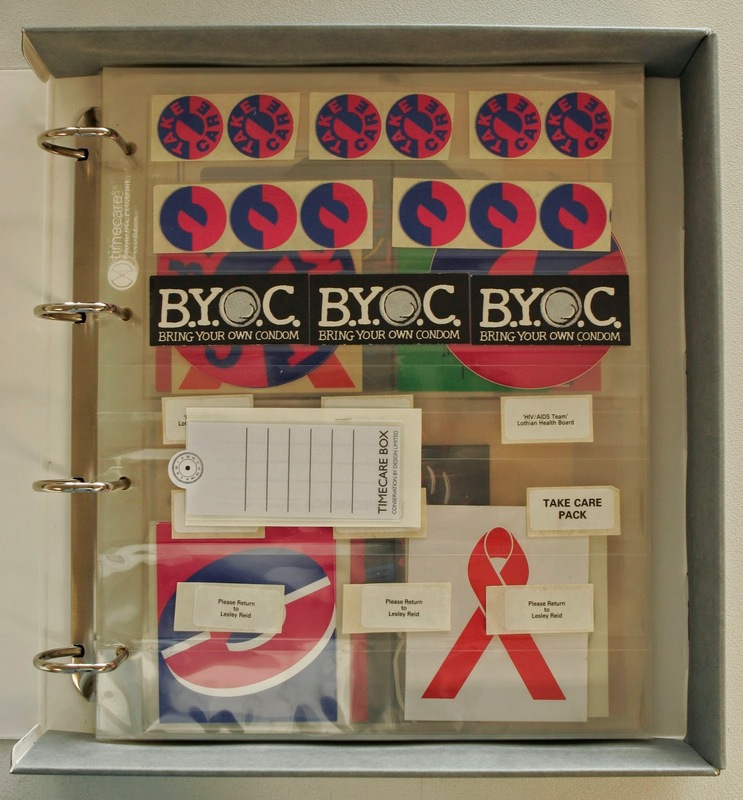 The HIV/AIDS project consists of two parts; conservation of the entire collection and cataloguing four of the twelve collections which have not yet been reviewed. For the first five months of the project, I was working alone focused solely on the conservation of the material. In May, project archivist Karyn Williamson was recruited to catalogue the four uncatalogued collections. Difficulties arose, however, as the conservation of the catalogued material was completed by the time Karyn began. This meant that the cataloguing and the conservation had to be carried out in tandem to avoid the interruption of the work flow. Working together, we came up with a temporary numbering system that allowed me to record what conservation treatments had been carried out on which documents and also allowed Karyn to begin box listing the collections. This means that although the order and composition of the collection may change, any conservation work carried out is always recorded. Postcards and stickers from GD22, before conservation, items wrapped in acid free tissue and cotton tape. Postcards and stickers from GD22, after conservation, rehoused in polyester album sleeves. Through working with Karyn, I have learnt a great deal about the process of cataloguing and what archivists actually do! I had trained in the conservation of works of art on paper, so I had little idea of how an archivist would record and order the meters and meters of documents in the HIV/AIDS collections. The materials used to create a fine art print and paper office documents are similar, so my conservation skills could be transferred to archival items, but I had no idea how an archivist would make sense of seemingly random papers in the collections. I now understand how a well ordered collection with a clear catalogue can aid access to the material and encourage use of the archive. For me, the whole point of conservation is to ensure that the useable life of the collection is extended for as long as possible. I believe archives should be used for the benefit of all, and not just locked away in a store room. I want the items to be seen, used and enjoyed (safely!) and through good conservation practice and a concise catalogue, this is possible! Karyn’s ideas on outreach; creating educational resources, oral history programmes and exhibitions have also been inspirational and injected new life into the project. As a newly qualified conservator who is used to working in isolation, it is great to have a new set of eyes on the material and has also given me ideas to take on for future projects. I hope that working with a conservator has also been beneficial to Karyn. Many of the re-housing techniques I have used can easily be applied, by a non-conservator, to other collections. For example, using paper tabs rather than a plastic clips, which can cause planar distortion, to hold sheets of paper together and making bespoke boxes to house mixed material. 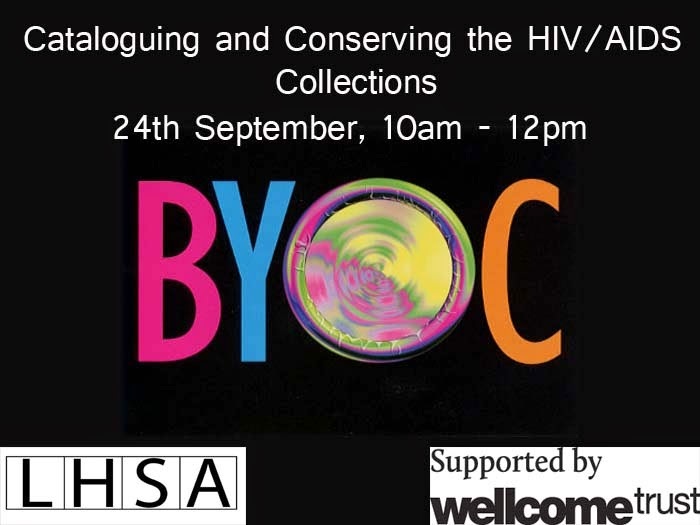 As a conservator, I have also been able to offer advice on digitisation and re-housing to groups who are considering depositing HIV/AIDS related material into the LHSA collection, as well as being on hand to deal with tricky material, such as pages stuck together with ink or degraded sticky tape. Sticky tape that has become discoloured and brittle over time. Overall, I think the partnership between conservator and archivist working together rather than sequentially has been extremely valuable. Not just in terms of preservation and cataloguing of the material, but the chance to learn new skills from each other that can be taken on to new projects and the opportunity to collaborate on outreach activities. Come down and find us for our #librarypop session on the 24th September (10am-12pm) on the first floor of the main library to find out more!